The internet is on fire in outrage at the killing of Trayvon Martin by George Zimmerman, and Zimmerman’s claim that it was in self-defense. The fury is, in my opinion, justified and will not be going away any time soon. Yet, despite the public disgust at this case, and of the police’s handling of it, Zimmerman is still free, and no charges have yet been filed against him. Below is a video from The Young Turks which I think greatly sums up the frustrations that any rational or sane person has when they look at this tragic murder. Note, I call it murder because that’s what I believe it to be. 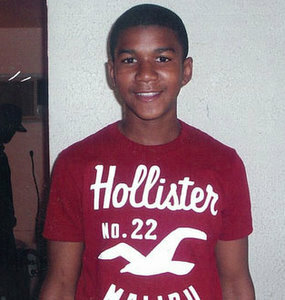 There has been a March for Trayvon Martin in Union Square Park in New York City this week and more are planned. Photographer Rene Carson captured the amazing scenes that were used in the CNN story. From what I’ve read and from what I understand, the law of self-defense does NOT apply because Zimmerman initiated the threat. He followed the teen (when he was told not to), he confronted the teen (when he was told not to) and he pulled a gun on Trayvon when the young man reacted to being grabbed and confronted. I’d react too if I’m walking home or wherever, in the dead of night and someone’s following me – the girlfriend was on the phone with Trayvon and gave testimony to this  – and am then grabbed by someone wielding a gun. Trayvon tried to defend himself – per Zimmerman’s bloody nose and thump to the back of the head  – but Zimmerman shot him anyway. Trayvon died that night for no other reason than being in the wrong place at the wrong time then being caught by a cop wannabe with a gun and an overactive imagination. All my opinion, of course. An ugly twist in this tragedy is the allegation that Zimmerman used a racial slur just before confronting and shooting Travyon Martin. And it begs the question, did he single out Trayvon because he was black? Is Zimmerman a racist? Here, Anderson Cooper explores the audio further for CNN and it’s clear (to me) that Zimmerman said something derogatory about Trayvon that I suspect was, indeed a racial slur. Judge for yourself. Then there’s the story covered by The Young Turks in which Glen Beck’s “The Blaze” tries to smear Trayvon Martin’s reputation using some deplorably dirty tactics, even by political standards. TYT discuss and analyze the comments on the website, but, quite frankly, my disgust at Glen Beck will not be ending any time soon. It’s an ugly, heartbreaking, tragic and senseless murder, and I don’t know if we will get justice or not. The court of public opinion wants Zimmerman prosecuted, but he’s using the “Hold Your Ground” law and self-defense to justify the murder. Again, I’m calling it murder because I believe wholeheartedly that Trayvon Martin was murdered. Whether Florida will prosecute or not remains to be seen. And if nothing else, maybe the Hold Your Ground law will be repealed or clarified to prevent another needless and senseless death such as this. After all, Zimmerman did follow Trayvon when told not to by the 911 dispatcher, and he did confront the teen, when told not to, and he did shoot him. Whether Zimmerman racially profiled or not remains to be seen, but its my humble opinion that he did, hence following Trayvon at all, and hence the racial slur muttered on the 911 tape. Now here’s the kicker, and this makes my blood boil more than anything else. If it was a black neighborhood watch person who shot and killed a white teen and tried to claim self-defense, do you think it would have taken 2 weeks for the news and social media to ignite the story? And do you think for one second the self-defense claim wouldn’t be vetted and dissected every which way but loose to prove beyond a shadow of a doubt what REALLY happened that fateful night? I didn’t think so. Trayvon Martin deserved the full protection of the law against the aggressor here, gun-wielding, self-indulgent, rent-a-cop-wannabe, racist vigilante (imho) Zimmerman. And though he was brutally and tragically murdered, he still deserves that same powerful, unwavering and COLORBLIND justice today. We shouldn’t have to fight so hard for the police to do their jobs and arrest Zimmerman. We shouldn’t need to have the Justice Department open an investigation into the events and the police handling of the tragedy. The very fact we need them to is a great and tragic testament to exactly how far this wonderful country has NOT come. Today, as I still watch and wait for justice to be handed down for the senseless killing of Trayvon Martin, no matter how much I love America and her greatness, sometimes she just flat-out lets me down. Today, thanks to Florida and their shockingly uncaring police department, this is one of those days.